Background/Aim: In Japan, gastric cancer is the most frequent cancer, and the morbidity rate is about 0.1% per year. Gastric bypass is considered not so suitable in Japanese patients, because the bypassed stomach cannot be checked completely by usual endoscopy after gastric bypass. Therefore, we have performed laparoscopic adjustable gastric banding (LAGB) and postoperative upper gastrointestinal endoscopy for screening of gastric cancer after the operation. Here, our data on the endoscopy are presented. Methods: Fourteen patients with 41±11 years (mean±SD) underwent upper gastrointestinal endoscopy after LAGB. Three of the patients had symptoms of obstruction and/or heartburn due to the banding, and the rest of the patients do not have any symptoms. 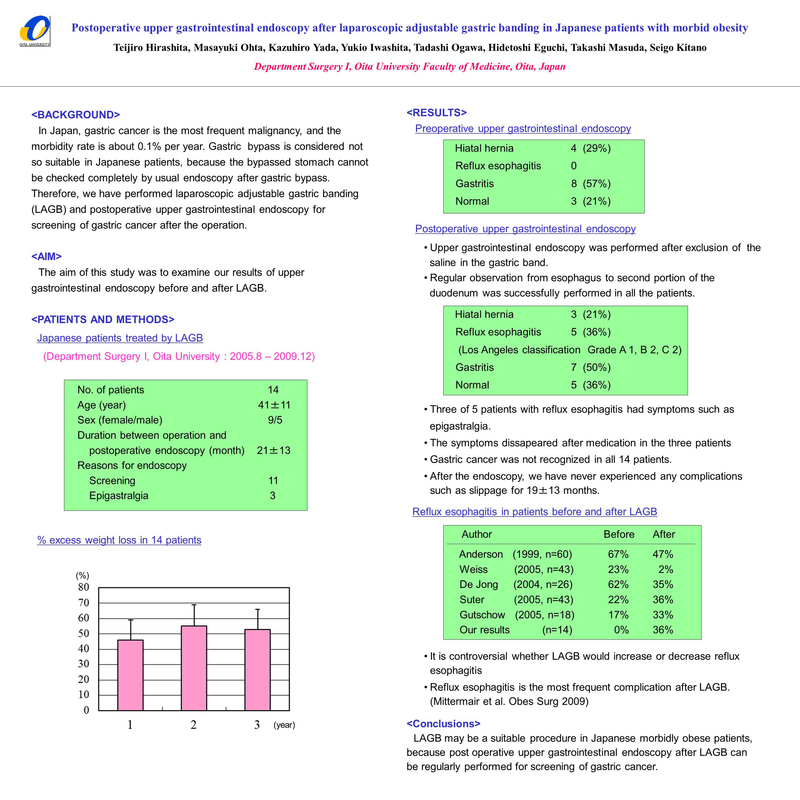 The duration between LAGB and the postoperative endoscopy was 21±13 months. Before the endoscopy, saline is routinely removed from the system of the band. Results: Regular observation from esophagus to second portion of the duodenum was successfully performed in all the patients. Although gastric cancer was not recognized, reflux esophagitis was found in all 3 patients with the symptoms (100%) and two of the patients without symptoms (18%). After the endoscopy, we have never experienced any complications such as slippage for 16±13 months. Conclusions: Since postoperative upper gastrointestinal endoscopy after LAGB can be regularly performed for screening of gastric cancer, LAGB may be a suitable procedure in Japanese morbidly obese patients.